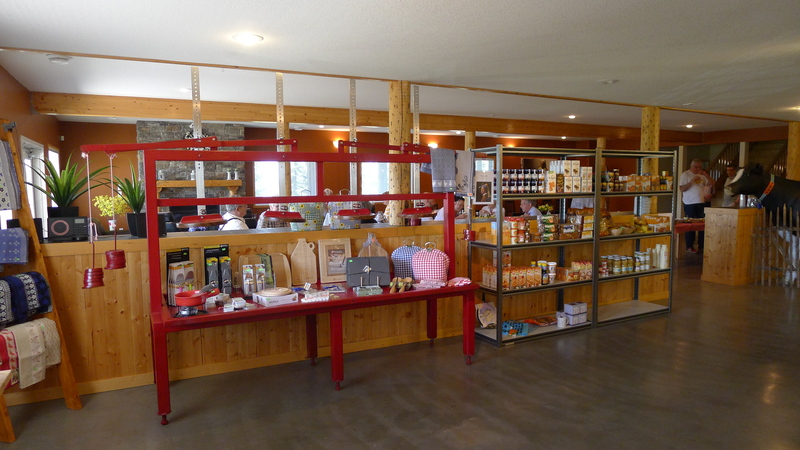 On Saturday May 25th, Edmonton and Calgary DCBC members met at Sylvan Star Cheese. We started with a very nice lunch featuring their own cheese of course but also yoghurt from Bles-Wold, another local dutch dairy product. After the lunch in which we had lots of opportunity the chat and network with our Edmontonian counterparts we went on a tour of the cheese factory lead by the companies owner, Jan Schalkwijk. We learned that the quality of the cheese depends on four factors: Feeding, milking, processing and ripening. Jan explained that his son takes care of the dairy farm and they feed their cows a mix of Grass and Alfalfa which creates a creamier milk. They are very careful when milking the cows to get as little air as possible when putting the sucker on the teat as that minimizes bacterial contamination. Jan has been a champion cheese maker for decades and knows all the right tricks to process the cheese so that the flavor is the best Gouda you can find. While Jan showed us around the different parts of the factory his wife Janneke treated us to samples of their most popular cheeses. And Jan and Janneke are also keeping up with technology: last year they had 440 solar panels installed on their roof and they now produce more electricity over the course of a year than they consume. After the tour pretty much all of us loaded up on cheese and other Dutch delicacies in the store at the factory. If you’re ever in or driving through the Red Deer region, it’s a not to miss stop! You can learn more about this great Dutch cheese farm in this Youtube video by Two Cowboys.